SOUTHERN UTAH – National parks and monuments across Utah are starting to open Friday since Gov. Gary Herbert announced over Twitter that money had been wired to the Department of the Interior Friday morning. The transfer finalizes a deal made with Interior Secretary Sally Jewell to reopen the state’s “Mighty Five” national parks and three national monuments/recreation areas using state funds. NOTE: Some of the reopenings Friday are not 100 percent, so only partial access may be available. Total access to the parks is expected to resume Saturday morning. The following information has been supplied by the governor’s office unless otherwise noted. Zion National Park is in the process of being reopened, though full access to the park may not be possible. The Zion Canyon and Kolob Canyons Visitor Centers, South Campground, and the Zion-Mt. Carmel Tunnel are open as of 1:10 p.m., Friday, according to the Zion National Park officials announced over Twitter. Complete park access and operations will resume Saturday. Bryce Canyon National Park is slated to reopen by 3 p.m., Friday, according to Bryce Canyon Country information website. The governor’s office has confirmed this and noted the park will be fully operational Saturday. Natural Bridges National Monument reopened at 10:30 a.m., Friday morning. Arches National Park will open the gates at 5:30 p.m., Friday, with full services resuming Saturday. Canyonlands National Park will be reopening at 8 a.m., Saturday. Both Canyonlands and Arches national parks have experienced recent weather-related damage to roadways and park infrastructure. Gov. Herbert said over Twitter that repairs will be done as soon as possible. Rainbow Bridge National Monument will also reopen as it is a part of the Glen Canyon (Lake Powell) National Recreation Area. 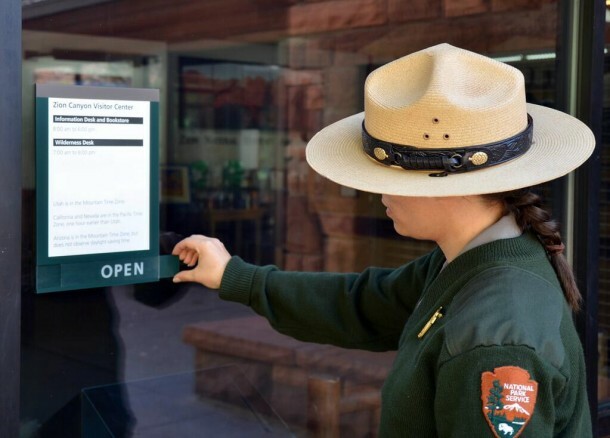 The area partially reopened at 1 p.m, Friday, with full operations resuming Saturday at 8 a.m.
Capitol Reef National Park is partially reopen as of 2:50 p.m., Friday. The park’s campground has also reopened. The park’s scenic drive will reopen at 3 p.m. Complete access and operations are expected to resume Saturday. Cedar Breaks National Monument will also be reopening between now and Saturday morning. Campsite reservations for Oct. 12 and beyond for the parks and monuments will also be honored, Herbert said. The national parks and monuments are reopening for the next 10 days thanks to a $1.6 million deal struck between the state and the federal government. Once those 10 days are up, the state may continue to fund the parks on a day-by-day basis. These areas were originally closed as a part of the government shutdown that began October 1. This report is being updated throughout the day. Perspective: Shutdown; Who is willing to pay the price?